ZIPP Speed Weaponry had a fantastic Tour of Georgia with victories and podium appearances all week long! With CSC, Phonak and Colavita-Bolla showing off their ZIPP wheels, nearly every type of wheel manufactured by ZIPP made its appearance on winning bikes. From the first stage victory of Team CSC's Lars Michaelsen, to the Overall Race Winner Floyd Landis of Phonak, ZIPP Speed Weaponry wheels set the pace. ZIPP PowerTap 202: ZIPP Tubular rim measuring 24.85mm deep laced into a PowerTap hub. The PowerTap hub has quickly established itself at "the" power metering system to own if you are serious about your capabilities and ultimate performance. Floyd Landis of Phonak rides the ZIPP 202 nearly every day to record his vital performance statistics. ZIPP 303: New for 2006, the ZIPP 303 is faster, deeper (44.15mm deep), and handles better in crosswinds. Just a bit quicker in acceleration than the ZIPP 404, the ZIPP 303 is making a great racing reputation for itself. Ridden by Team CSC for quick sprints and handling in tight corners. ZIPP 404: The ZIPP 404 is a 58mm Deep-V rim with the split personality of being able to race nearly every day, from road to TT to Triathlon to fast recreational riding. Ridden by nearly everyone on Team CSC and Phonak, it's our most popular wheel. 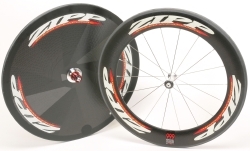 ZIPP 909: A sweet combination of the aerodynamic dimpled Disc and 58mm deep front wheel, it is a fast wheel set and a great combination for TT and Triathlon. Ridden by Team CSC and Phonak on twisty or windy TT courses. The ZIPP 909 holds the rcord for the fastest TT in the Giro d' Italia. ZIPP 999: Our FASTEST combination, the ZIPP 999 set is a 81mm Super Deep-V front wheel paired with a dimpled aerodynamic Disc. This is the fastest combination available ridden by both Floyd Landis of Phonak who won the time trial at the Tour of Georgia and David Zabriskie of Team CSC who came in third and who had the Fastest TT ever recorded at the Tour de France at 54.676kph..